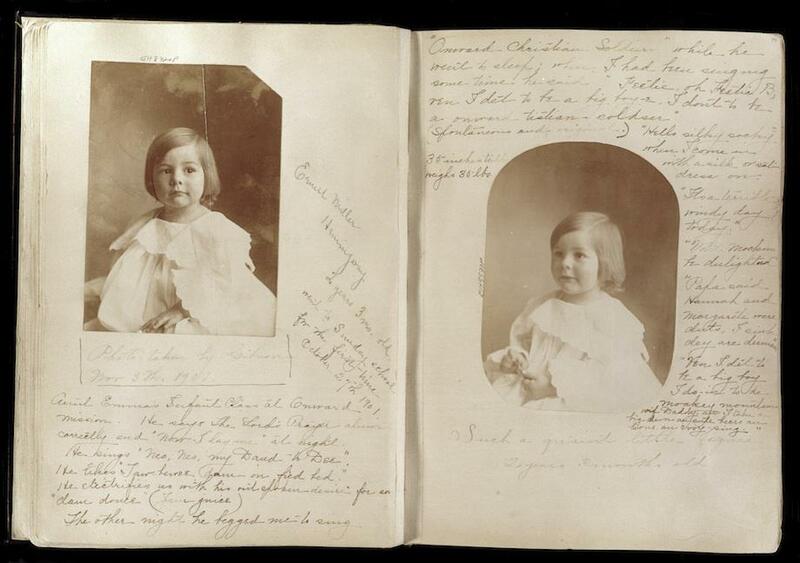 Hemingway scrapbooks: Grace Hemingway's records of son Ernest Hemingway's babyhood. The JFK Presidential Library and Museum has just released fullly digitized copies of Ernest Hemingway’s mother’s scrapbooks, which chronicle the writer’s childhood and adolescent years in five volumes. 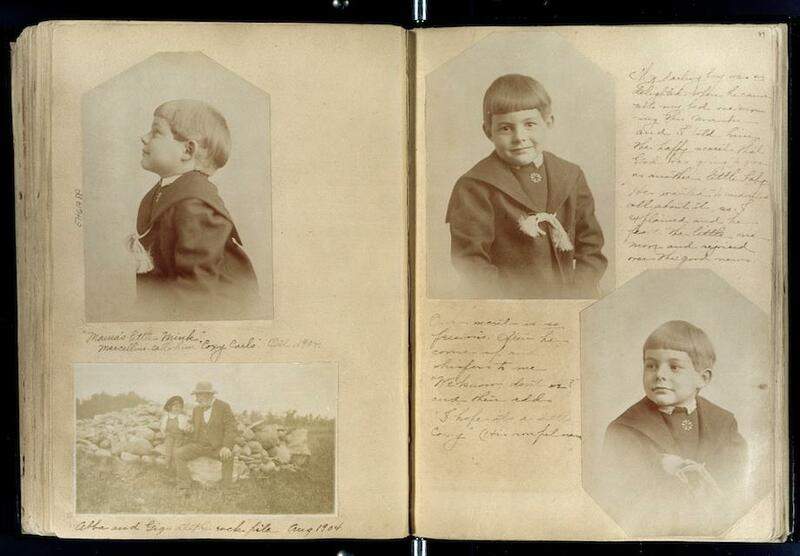 Here are three spreads from those volumes, showing “Ernest Miller” (as his mother often called him in her captions) at three different ages. For Hemingway aficionados, the scrapbooks shed light on the writer’s complex relationship with his mother, Grace. Born in Oak Park, Ill., in 1899, Hemingway was the second of six children and the first son. Later in life he would profess to despise his mother, blaming her controlling habits for his father’s suicide. He famously refused to attend her funeral. But later biographers have argued that Grace, who was a musician and teacher, was unfairly confined by her domestic role and restless as a result. Looked at from this perspective, the maternal attitudes that Hemingway perceived as overbearing were actually expressions of frustrated creativity. The scrapbooks, which juxtapose Grace’s observations and notes with photographs, drawings, and other ephemera, bear out this hypothesis. Grace recorded all of the bits of baby talk that she found brilliant and (as she wrote) “spontaneous and original.” She called Ernest “Mama’s little mink” and delighted in their confidential conversations. 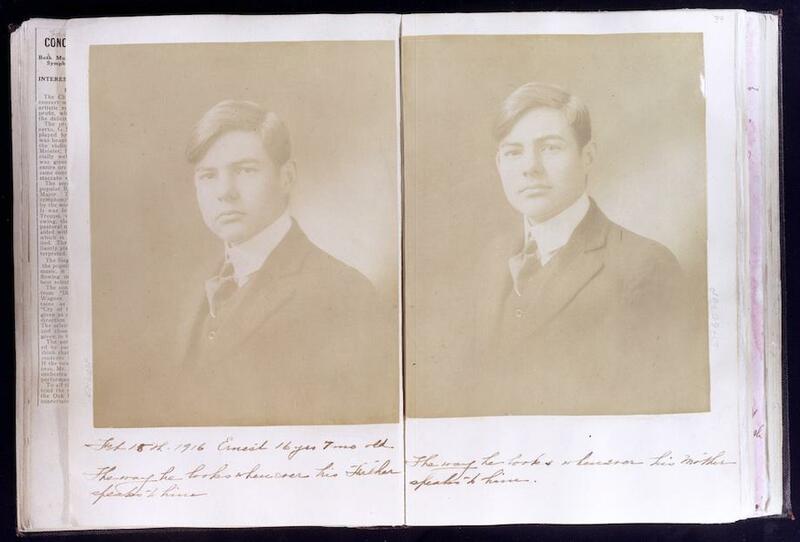 Transcripts of Grace Hemingway’s captions, which appear underneath each image, are courtesy of the JFK Library. Grace Hall Hemingway, Ernest Hemingway Collection/John F. Kennedy Presidential Library and Museum, Boston.